My Food Network Star addiction has paid off! I watched Food Network Star this summer just as previous ones, but this season was particularly entertaining. As I watched the pilot pitch episode, I wanted to make Damaris’ dish and I wanted her to win! I had some pork tenderloin, so I decided to give her cooking advice a try. Man doesn’t eat mustard (at ALL) so I didn’t make the apple mustard butter. I also did not have sorghum or molasses, so I used Texas honey. Excuse the pictures, this was a put dinner together in a hurry type day. To make: : In a small bowl, stir together the honey, salt, black pepper, crushed red pepper and oil. Trim the pork loin of any excess fat, and transfer to a shallow roasting pan. 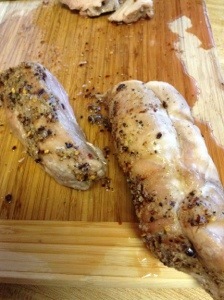 Rub the pork loin with the honey and spice mixture, coating evenly. Roast at 400 until the internal temperature is 140 degrees F, about 45 minutes. My guys don’t want to see any pink, so I roasted it closer to an hour. Remove from oven and let rest for 10 minutes. 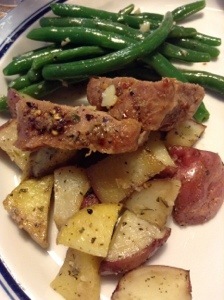 We sliced the tenderloin into medallions and served it with roasted red skinned & Yukon gold potatoes and garlic green beans. I think next time I make it, I will use 1tablespoon of salt and 1/2 teaspoon of red pepper flakes. I am a wimp when it comes to spicy food, but I was a bit shocked to find it was a little to salty for me. Toss potatoes with olive oil, salt, pepper and herb de Provence. Throw them into the bottom of the roasting pan. Lay the pork over top and roast as directed above. To make the green beans, blanch cleaned fresh green beans for two- three minutes. Set aside. In a sauté pan, over medium heat, cook garlic in one to two tablespoons of olive oil until fragrant. Add blanched green beans, season with salt and pepper, and sauté five minutes. Beans should be bright green and still firm. If you don’t follow Food Network Star, Damaris won! Yea for culinary instructors! Yea that my time spent voting wasn’t wasted! If this recipe is any indicator of those to come, I will definitely be tuning in to her show this fall. This recipe was quick, easy, and delicious!